That’s because we went for short term easy, long term Oh my god, how pregnant are you? Blink twice if you’re going to give birth in the next 48 hours route. You see, there are two ways to go about breeding goats. The first is sooooo straightforward. Throw a buck in the field! For us, two newbie parents getting used to the world revolving around our own kid…8 pounds of adorable with a healthy dose of throw up and screaming…this was a good option. The ‘least work’ option. The downside? Our experience over the last seven weeks. Which will likely continue for at least another week or so as we wait for three more does to kid. Uncertainty. False alarms. Panic every time someone has to leave the farm. Which is why we will never go that route again. Instead, we will go the more professional path of scheduled dates only. Buck(s) are kept separate, ladies stay in their lady-only herd. Dates are carefully marked, windows of potential birth are known (just a 10 day period!) and all is well with the world. Alright, so back to Monday. The baby monitor had died so was charging in the kitchen. I noticed it was turned off while playing wiht Isla and asked Scott if he could turn it back on. We’re talking off for maybe twenty minutes, folks. 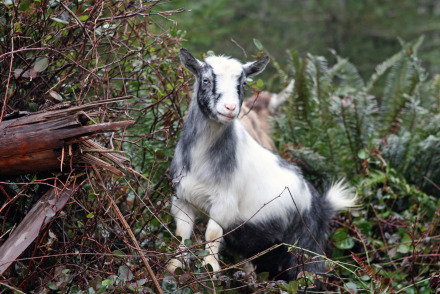 I’m sitting by the window where I can usually hear a grumpy – probably hungry – goat whine at us. Easily. I didn’t believe him. I thought it was a joke and laughed at first. Nope, the look on his face quickly changed my mind. Thankfully, our friend Scout was here to catch Isla as I frantically composed myself to go see what was happening in the barn. Are they ok? Is Maple ok? Are they boys? Please don’t be boys. What if she’s still retained one. What if she’s not ok. What if she gets sick. What if they get sick? These aren’t the worst worries running through my brain. What if they die. What if they are dead. They are decidedly, blissfully, magically…not dead. Sprout was in the kidding stall in the bigger puddle of goop while Honey lay in the barn ‘hallway’ covered in slightly less goop, perhaps because her mum and grandmother were both licking the goop away. As a team. My heart melted and I paused for a second to take in this moment before reaching for the pile of old towels/receiving blankets. They had Honey’s first bath well in hand so I turned my attention to Sprout. Oh good lord it’s tri-coloured. Please be a girl, please be a girl. All the while mopping up goop and working to get her dry and warm and ready to get up on those feet and have some milk. At which point, we closed the door on our lovely herd queen, Gertie. Seasoned mama. Brand new grandma. Time for Maple and her kids to have some quiet bonding time. Just as soon as we confirm they are up and about and nursing easily. It was somewhere at this point I worked up the nerve to take a peek at private parts and see what we had. I could have fainted I was so happy and relieved. We had a bit of concern over selenium so a little dab of vitamin boost was placed in the corner of each mouth. 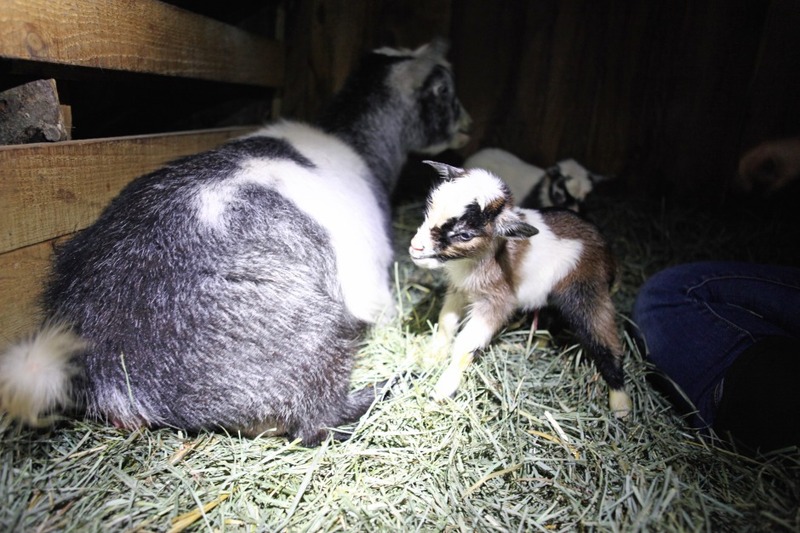 Then we worked on getting Maple, a rather frantic first time mama, to calm down and let her babies nurse. This proved to be a challenge. She was so intent on licking them that they couldn’t quite figure out where all the parts were back there. To top it off, her placenta had started to come out and rather firmly smacked each baby in the head, at least once. 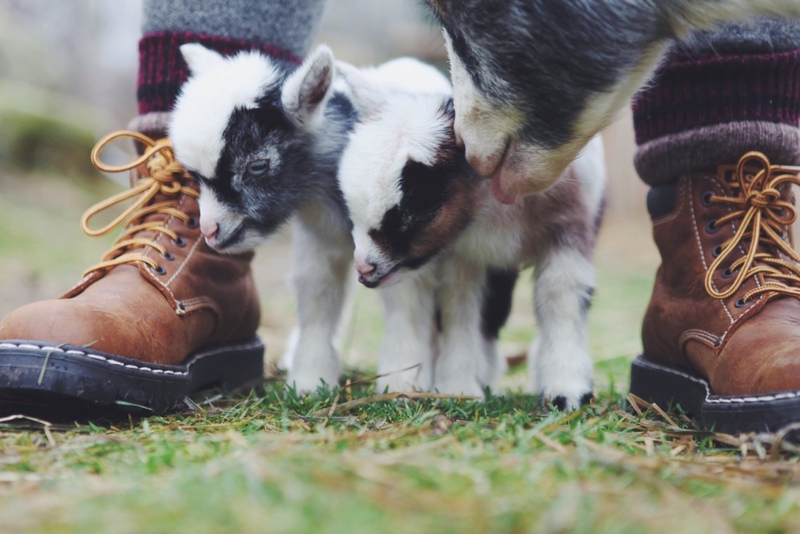 Need I remind you, this is a farm blog. Placentas happen. 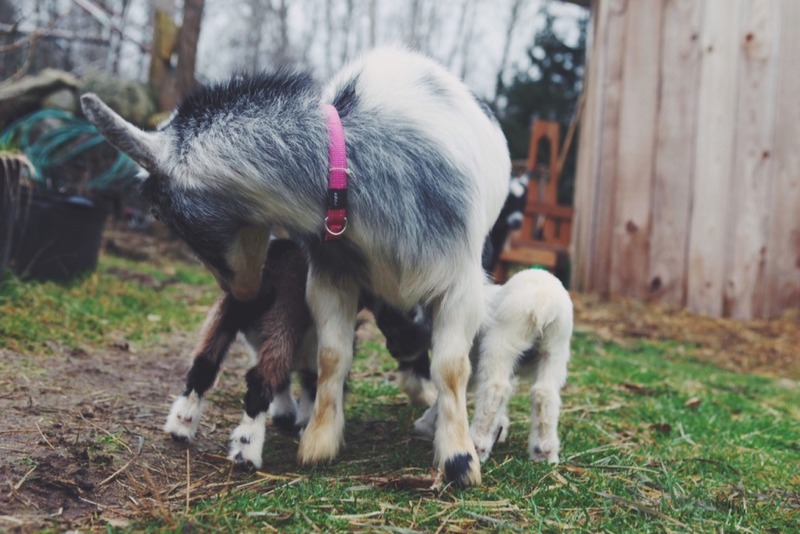 All baby goats need milk – this first milk, colostrum – to thrive. They especially need it soon after birth. Nigerian dwarfs typically need it very soon – 30 minutes or so – after they are born. We were closing in on the 20+ minute mark and were no closer to baby’s first nurse for either kid. So a quick hand express of less than an ounce of colostrum carefully drawn up into the smallest syringe and neatly gently smushed into the corner of their mouths. Taking care to not try and force anything lest it end up down their windpipes, not into their brand new bellies. You’d have thought that we had given them superpowers. Their energy and enthusiasm for this whole being on earth thing multiplied in a matter of minutes. But now they think I’M the source. Oh kids. Temporary firm realignment back to mum fairly quickly showed them that their best bet was the immensely headbuttable udder attached to their slowly unwinding (but still rather high strung) mum. That was two days ago and the time since then has been filled with intermittent trips out the barn to check on the two new additions and their rockstar mom, along with Gertie (who is currently sequestered next to her daughter and grandkids) and the twins who should add more fun to our day soon. I hope. I think. At some point. The importance of having people you can call. Or text. or Instagram. Last year when we went through a nightmare premie birth of twin bucklings that didn’t make it, I would have been at a loss without my good friend Tamara at Linnaea (who has many seasons lambing under her belt) as well as the smart, experienced counsel of @twwly and @boonoos on Instagram. You need people and you should never feel ashamed or silly to ask for help, especially when animals are concerned. Towels. And more towels. You could probably use more towels. Just bring all the towels. In anticipation of this momentous event – and also because we kept using our towels to wipe off our rank-smell-factory darling dog – I bought new bath towels that I loudly proclaimed are special. All other towels/receiving blankets/cloths are fair game for animals. 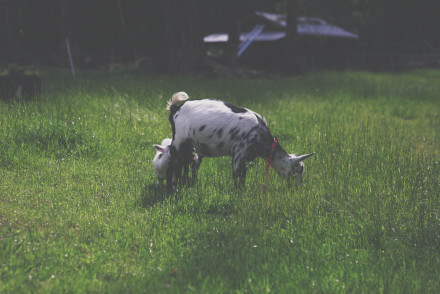 I’m so glad I did because this meant a massive pile of towels were handy (in the barn – keep at least some in the barn if you can) for quickly drying them off without wasting time debating whether you want goat birthing fluids on your favourite bath towel. Act fast, be decisive but remember…this is how nature happens. 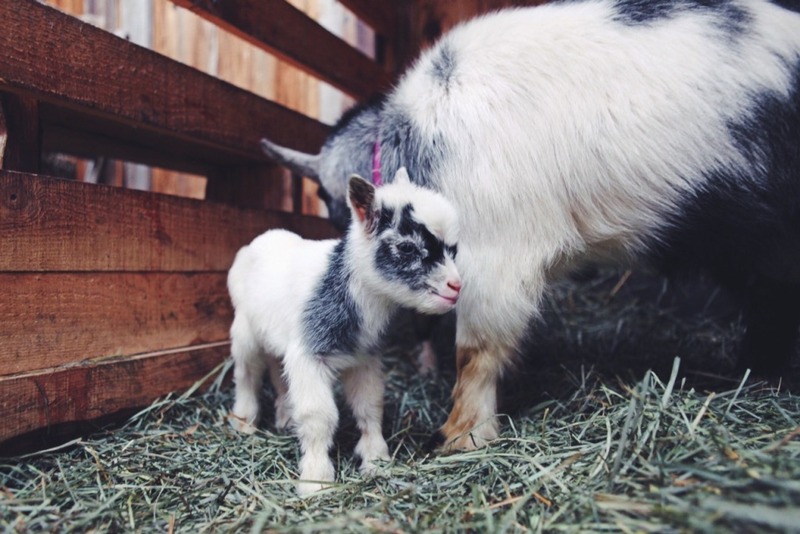 Goats have been giving birth a lot longer than we’ve been trying our hand at farming. Mostly you need to stay out of the way. But if had needed to intervene with the birth, keeping a level head but moving quickly would have been important. We did intervene by milking out a bit of colostrum to make sure they got a taste as soon as possible while Maple calmed down long enough to stand still for her wobbly legged babes. Maybe they would have been fine – but that’s the choice we made and I’m glad we made it. And now…back to the barn. As a current urbanite (Toronto) who longs for the “simplicity” of country life, I have been devouring your blog. 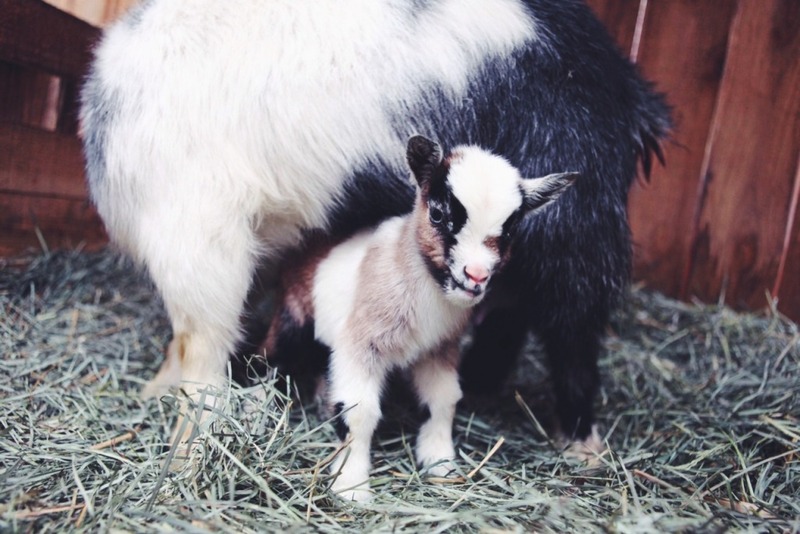 Also, as a lifetime goat lover, these baby goat pictures and video are the most adorable things I have ever seen! 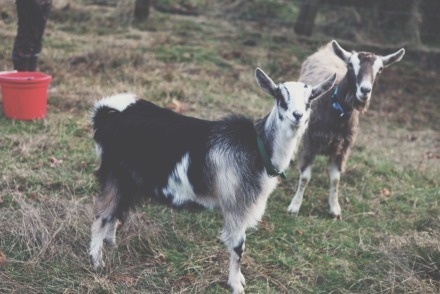 I can’t wait for the day when I have a herd of Nigerian Dwarf goats of my own. Thank you for sharing.